Proteolytic machineries containing multisubunit protease complexes and AAA-ATPases play a key role in protein quality control and the regulation of protein homeostasis. In these protein degradation machineries, the proteolytically active sites are formed by either threonines or serines which are buried inside interior cavities of cylinder-shaped complexes. In eukaryotic cells, the proteasome is the most prominent protease complex harboring AAA-ATPases. To degrade protein substrates, the gates of the axial entry ports of the protease need to be open. Gate opening is accomplished by AAA-ATPases, which form a hexameric ring flanking the entry ports of the protease. Protein substrates with unstructured domains can loop into the entry ports without the assistance of AAA-ATPases. However, folded proteins require the action of AAA-ATPases to unveil an unstructured terminus or domain. Cycles of ATP binding/hydrolysis fuel the unfolding of protein substrates which are gripped by loops lining up the central pore of the AAA-ATPase ring. The AAA-ATPases pull on the unfolded polypeptide chain for translocation into the proteolytic cavity of the protease. Conformational changes within the AAA-ATPase ring and the adjacent protease chamber create a peristaltic movement for substrate degradation. The review focuses on new technologies toward the understanding of the function and structure of AAA-ATPases to achieve substrate recognition, unfolding and translocation into proteasomes in yeast and mammalian cells and into proteasome-equivalent proteases in bacteria and archaea. Proteins are synthesized during translation through ribosomes and eliminated by degradation through proteases. Since protein synthesis and degradation are expensive ATP-consuming processes, highly selective mechanisms ascertain that only proteins allotted to degradation are eliminated. If the regulation of protein homeostasis fails, futile cycles of protein synthesis and turnover will ruin the economic budget of our cells. Functional proteins would be depleted and non-functional proteins would accumulate in cytotoxic aggregates (Kopito, 2000; Ciechanover and Brundin, 2003; Goldberg, 2003; Schmidt and Finley, 2014). Thus, functional proteins must be sorted from non-functional proteins to meet the actual cellular situation with rapid adjustments to metabolic changes or environmental stress. How protein textures shift in response to cellular changes is an interesting question in the field of regulated protein homeostasis but out of the scope of this review. Here, we will focus on ATPases associated with diverse cellular Activities (AAA) that collaborate with proteasomes, the most complex proteases with unique opportunities for regulation of cellular proteolysis. AAA-ATPases typically convert the energy of ATP hydrolysis into mechanical force through conformational changes in their subunits, cope with the unfolding of protein substrates and synergistically act with proteasomes and proteasome-like proteases for degradation (Schmidt et al., 1999; Sauer and Baker, 2011; Matyskiela and Martin, 2013). However, they can also aid protein refolding allowing partial proteolysis or the escape of specific proteins from degradation. A myriad of proteins is subject to AAA-ATPase coupled protein degradation by proteasomes. Proteasomal substrates are short-lived, have crucial functions within a short time frame and are eliminated within few minutes by proteasomal proteolysis. Proteasomal substrates are usually post-translationally modified by poly-ubiquitin chains, a series of ubiquitin molecules linked by isopeptide bonds to each other and to the substrate. The first proteins conjugated to ubiquitin, initially named heat-stable ATP-dependent proteolysis factor, were detected by Ciechanover and Hershko at a time, when scientists were perplexed by the paradox that proteins are turned over in an ATP-consuming manner after being synthesized by ATP consumption (Ciechanover et al., 1980; Hershko et al., 1980). Varshavsky and co-workers revealed that ubiquitin N-terminallyfused to galactose drastically reduced its half-live depending on the N-end rule, the N-terminal amino acid of galactose (Bachmair et al., 1986). The first poly-ubiquitylated substrates identified in cells were cyclins, cyclin-dependent kinase activators, and inhibitors regulating cell cycle progression (Kirschner, 1999). Also nascent polypeptides arising during protein translation are sources of proteasomal substrates, though their abundance might be less than originally assumed (Vabulas and Hartl, 2005). Poorly folded or misfolded nascent polypeptides may expose hydrophobic domains on the surface. If not instantaneously eliminated by proteasomal degradation, they are prone to nucleate toxic protein aggregations and the early onset of neurodegenerative diseases (Turner and Varshavsky, 2000; Navon and Goldberg, 2001; Medicherla and Goldberg, 2008). The 26S proteasomes exist in eukaryotic cells throughout the kingdom. They are composed of ~40 different protein subunits. Fourteen of these subunits are assembled in the proteolytic core particle (CP) which is composed of a stack of four seven-membered rings. Both outer rings contain seven alpha-subunits, both inner rings seven beta-subunits. The proteasome belongs to the class of self-compartmentalized threonine-proteases (Baumeister et al., 1998). The catalytic threonines conferred by three different beta-subunits are sequestered within the two inner beta-rings. Their substrate binding pockets have preferences for hydrophobic, basic, and acidic amino acids and are related to chymotrypsin-, trypsin-, and caspase-like peptide cleavage activities, respectively. The outer alpha-rings form ante-chambers of the catalytic chambers enclosed between the two inner beta-rings (Tanaka, 2009). The central pores of the outer alpha rings are normally closed. N-terminal extensions of the alpha subunits occlude the central pores and restrict the diffusion of small chromogenic peptides used to assay proteolytic activities. Thus, free CP exhibits latent peptide cleavage activity (Groll et al., 1997; Orlowski and Wilk, 2000), at least under physiological potassium ion concentrations (Kisselev et al., 2002). Depending on the ions in the solution dynamic fluctuations between open and closed states of the CP exist as well as suggested by atomic force microscopy and NMR studies (Osmulski et al., 2009; Ruschak and Kay, 2012). The conformational fluctuations of the central pores of the CP depend on sodium and potassium concentrations (Kohler et al., 2001; Osmulski et al., 2009). Detergents such as 0.02% SDS trigger the opening of the alpha-ring gates and allow free diffusion of chromogenic peptides into the CP. Not only detergents but also fatty acids, cardiolipin and polylysine open the alpha-ring gates and significantly stimulate peptide cleavage activity (Ichihara and Tanaka, 1989). Thus, folded cellular proteins have restricted access to the proteolytic chamber to minimize nonspecific degradation. In vitro, natively disordered substrates can access the internal catalytic sites by threading their loose termini through the gates of the CP. Also loops lacking strong secondary structures can traverse the channel into the proteolytic cavity of the CP suggesting that intrinsically disordered protein (IDPs) domains trigger gate opening of the CP (Liu et al., 2003; Ben-Nissan and Sharon, 2014). To which extent IDPs are committed to proteasomal degradation remains to be examined, since IDPs might be shielded by chaperones belonging to the AAA-ATPase family and “nanny” proteins which insure their maturation into important regulatory and signaling proteins (Tsvetkov et al., 2009). Without protection proteins with IDPs might represent favored proteasomal substrates as long as they are not aggregated. Along these lines, disordered regions within regulatory and signaling proteins affect their half-life (Tsvetkov et al., 2012; van der Lee et al., 2014). The gate opening of the CP is regulated by proteasome activators (PA), which relieve the autoinhibition of the CP by the N-terminal extensions of the alpha subunits. PA700, the regulatory complex (RP) of the eukaryotic proteasome, is the best-characterized PA and contains ~25 subunits. The RP binds to either one or both ends of the CP. The 240 kDa protein PA200/Blm10 is an alternative PA that is highly conserved from yeast to human. It stimulates the cleavage of small chromogenic peptides but does not contain AAA-ATPase activities required for polypeptide unfolding (Rechsteiner and Hill, 2005). In contrast to these single protein PAs the RP is composed of ~25 different subunits which are assigned to two subcomplexes, the RP lid and base. Specifically, the RP base contains a hexameric ring of six subunits named Rpts in yeast or PSMCs in mammals that are members of the AAA-ATPase family (Glickman et al., 1998). The ATPase ring is adjacent to the CP alpha ring upon RP-CP binding (Baumeister et al., 1998). Newly advanced technologies using single particle cryo-EM provided detailed insight into the mechanism of how the ATPase ring is properly positioned for alpha ring opening to channel the translocation of unfolded substrates (Matyskiela and Martin, 2013; Unverdorben et al., 2014; Chen et al., 2016; Rodriguez-Aliaga et al., 2016). Basically, in eukaryotic cells the poly-ubiquitin chain is the post-translational modification of a protein to be recognized as a potential substrate by the RP and to be recycled prior to degradation. Degrons are encoded in the amino acid sequence of the substrate which facilitate substrate processing. In the canonical sense, a chain of at least four isopeptide-conjugated ubiquitin molecules in combination with unstructured termini/loops within the substrate required to be recognized as degradation signal by the RP. Although all AAA-ATPases act on the protein substrate concurrently with the removal of the poly-ubiquitin chain, Rpt5, one of the Rpt ATPase subunits, was found to bind ubiquitin (Lam et al., 2002). To accommodate poly-ubiquitylated substrates, the proteasome shows a high degree of plasticity and versatility (Glickman and Raveh, 2005). 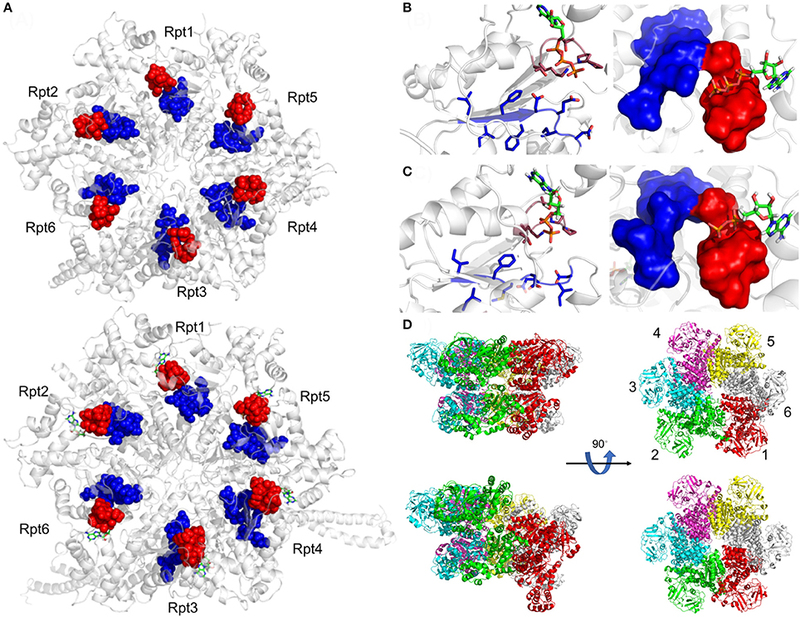 Beyond shuttling ubiquitin receptors which transiently bind to ubiquitin-like domains on RP subunits, three RP subunit, namely Rpn1, Rpn10, and Rpn13 in yeast or PSMND2, PSMD4, and ADRM1 in mammals, serve as intrinsic docking sites for ubiquitin molecules (Finley, 2009; Rosenzweig et al., 2012; Shi et al., 2016). One major delivery site for poly-ubiquitin chains involves Rpn10 and Rpn13, the latter bound to Rpn2. The poly-ubiquitin chain is held between Rpn13 and Rpn10. The ubiquitin hydrolase Rpn11, a subunit of the RP lid and closely positioned to Rpn2 is responsible for the isopeptide-hydrolysis of the poly-ubiquitin chain. The polypeptide stripped off ubiquitin is adopted in an unfolded state by the adjacent AAA-ATPase ring. During the dynamic process of (i) substrate accepting, (ii) commitment, and (iii) translocation three hypothetic conformational states of the yeast proteasome were distinguished by single particle cryo EM analysis (Figure 1) (Lander et al., 2013; Unverdorben et al., 2014). The translocation state might be dissected into more intermediates, since human proteasomes exist in at least four states during substrate processing (Wehmer and Sakata, 2016). Figure 1. Three functional states of the eukaryotic proteasome. Conformational states of the eukaryotic proteasome, S1 (Left), S2 (Middle), and S3 (Right). The alpha ring of the catalytic core particle (CP) is colored in purple with full views of the regulatory particle (RP) for S1/S2 and longitudinal cross section for S3. The central channel through the CP and ATPase ring is indicated with yellow and white dashed lines, respectively. In the RP, the AAA-ATPase ring along with the N-terminal coiled-coils is colored in cyan. The non-ATPase RP subunits are colored in white except for Rpn1 (brown), Rpn2 (green), Rpn10 (orange), Rpn11 (yellow), and Rpn13 (magenta). In S1, a poly-ubiquitylated substrate (in red labeled with “S” attached to the tetra-ubiquitin chain in blue labeled with “Ub”) is recognized by the ubiquitin receptor Rpn13. Subsequently, the poly-ubiquitin chain is anchored to the ubiquitin receptor Rpn10 leading to substrate placement near the N-ring. In S2, the isopeptide bond between the substrate and poly-ubiquitin chain is cleaved by Rpn11 and the unfolding of the substrate is initiated. In S3, the unfolded substrate is translocated through the central pore of the AAA-ATPase ring into the central channel of the CP for degradation. The central pores of the AAA-ATPase O-ring and the CP are not aligned in S1 and S2 but are in S3. A 25° rotation of S1 to S2 facilitates the substrate placement into the N-ring and activates Rpn11. The figure was prepared using the PDB IDs: 4CR2, 4CR3, 4CR4, 1UBQ, 2ZNV, 2Z59, and 1UZX through PyMOL (Ver. 1.8.0.2) molecular graphics software (Schrodinger, LLC, New York). The second delivery site for a poly-ubiquitin chain involves Rpn1 and Ubp6, named PSMD2 and USP14 in mammals. While the ubiquitin moieties are bound to Rpn1, the adjacent Ubp6 hydrolase trims super-numerous poly-ubiquitin chains. Again, the polypeptide cleaved off from the poly-ubiquitin chain is proposed to be furthered to the AAA-ATPase ring for unfolding and translocation into the CP (Shi et al., 2016), though Ubp6 is distant from the entrance pore of the AAA-ATPase ring. By trimming lengthy poly-ubiquitin chains the substrate can even escape final degradation, consistent with the finding that inhibition of Ubp6 stimulates protein degradation (Crosas et al., 2006). A couple of additional ubiquitin receptors are known to ensnare Rpn1 and transiently deliver poly-ubiquitylated proteins to the RP (Rosenzweig et al., 2012). The remote binding of poly-ubiquitin chains most likely transmits allosteric conformational changes toward the coaxial CP alpha ring and the AAA-ATPase central pore to prepare the holo-enzyme for its commitment to protein degradation (Bech-Otschir et al., 2009; Peth et al., 2010). Notably, poly-ubiquitin modifications are not compulsory for substrate degradation by proteasome holo-enzymes. One of the most prominent substrates that is degraded in an ATP-dependent matter without poly-ubiquitylation is ornithine decarboxylase (ODC) as elaborated by Coffino and co-workers (Erales and Coffino, 2014). Hexameric AAA-ATPase rings involved in ATP-dependent protein degradation exist in 26S proteasomes of eukaryotic cells and prokaryotic ancestors such as HsIU AAA-ATPase which is associated with HsIV protease composed of two homohexameric rings (Figure 2). In archaea proteasome-alike proteases composed of four heptameric rings are associated with VAT (Valosin-containing protein-like), the homolog of the ubiquitous AAA-ATPase Cdc48/p97, and PAN (Rockel et al., 2002; Benaroudj et al., 2003). In actinobacteria Mpa associates with the mycobacterial 20S proteasome, another evolutionary ancestor of eukaryotic proteasomes (Striebel et al., 2010). Hexameric AAA-ATPase rings also associate with prokaryotic AAA proteases such as ClpP, a serine protease composed of two heptameric rings. In these bacterial systems the AAA-ATPases are known as Clp ATPases (X, single ATPase ring; A, double ATPase ring) (Grimaud et al., 1998; Baker and Sauer, 2012). Figure 2. Domain organization of AAA-ATPases. (A) Magnified view of the monomer (left) and overall view of the oligomer (right) of Mpa containing two OB rings, OB1 and OB2, along with the N-terminal coiled-coils (blue). 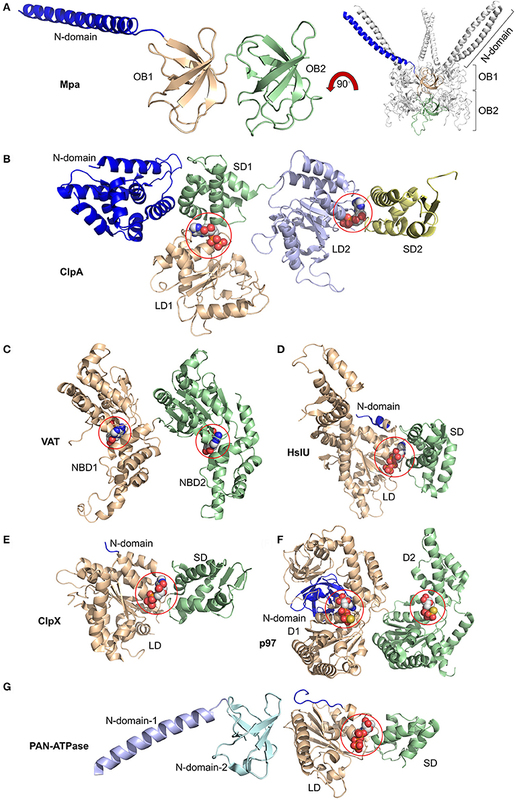 Magnified views of monomers bound to nucleotides highlighted by spheres of (B) ClpA with small and large domains SD1, SD2, LD1, and LD2 bound to ADP at the SD1/LD1 and SD2/LD2 interfaces; of (C) Valosin-containing protein-like ATPase (VAT) with nucleotide binding domains NBD1 and NBD2 bound to ATP; of (D) HslU with N-terminal (N), large (LD), and small (SD) domains and ATP; of (E) ClpX with N-terminal (N), large (LD), and small (SD) domains with ADP; of (F) p97/VCP/Cdc48 with N-terminal (N) and domain-1 (D1) and -2 (D2) bound to ATPγS; of (G) proteasome-activating nucleotidase (PAN) with N-domains 1 (from Gcn4) and 2 and large (LD) and small (SD) domains. Again, ATP is bound at the SD/LD interface. This figure was prepared based on the availability of structures in the protein data bank using the PDB IDs: 3M9D, 1KSF, 5VC7, 1DO0, 3HWS, 5C18, 2WG5, and 2WFW through PyMOL (Ver. 1.8.0.2) molecular graphics software (Schrodinger, LLC, New York). Interfaces between the hexameric AAA-ATPase ring and the heptameric proteasome suggested a symmetry mismatch which precludes close complementary neighborhood and allow room for the dynamic changes underlying the mechanisms of protein translocation though the coaxial pores of the AAA-ATPase and the adjacent protease. The architecture of prokaryotic AAA proteases is simple. The AAA-ATPase is a homohexamer. No RP equivalent is associated with the protease core. Bacterial proteases require no ubiquitin receptors, as ubiquitin signaling does not exist in prokaryotes (Jastrab and Darwin, 2015). Only in Mycobacteria tuberculosis, one of the world's deadliest pathogens, Pup, the prokaryotic ubiquitin-like protein, targets proteins by mono-pupylation for degradation. To recognize the Pup degradation tag, the N-terminal coiled coil regions of the AAA-ATPase Mpa homohexamer serve as template for the C-terminal half of Pup1 to fold into a helix (Wang et al., 2010). Beside the rare modification of pupylation, a variety of degrons exists which are encoded in the primary sequence and render a protein into a substrate. Due to their propensity for intrinsic disorder these degrons are prototype-patterns in protein degradation and not only recognized by prokaryotic but also by eukaryotic AAA proteases (Ravid and Hochstrasser, 2008; Varshavsky, 2011). Most bacterial proteasomes are dodecamers of beta subunit ancestors. All other ancestor proteasomes with an exception of the bacterial species from Rhodococcus are composed of identical alpha and beta subunits. Their overall organization is similar. The alpha subunits are arranged in seven-membered outer rings, and the beta subunits in seven-membered inner rings, yielding a barrel-shaped particle with alpha7-beta7-beta7-alpha7 configuration as evidenced by the archaeal species from Thermoplasma acidophilus (Jastrab and Darwin, 2015). The opening by 23 Å of the alpha ring in bacterial proteasomes is wider than the opening by 13 Å in archaea, leading to a funnel through the center of the entire complex (Lowe et al., 1995). In contrast to eukaryotic proteasomes where each of the seven distinct alpha subunits occupies a specific position to guarantee the closed-gate state, the N-terminal extensions of the identical alpha subunits of Thermoplasma acidiphilum proteasome are disordered and unable to lock the central pore (Lowe et al., 1995). Interestingly, the Mycobacterium proteasome has a closed gate, because the alpha-type subunits assume three different conformations. Three subunits form a rectangular shape (“L”), three form an extended linear shape (“E”), and one projects away to avoid a sterical clash (“V”) (Li et al., 2010). Thus, in Mycobacterial and eukaryotic proteasomes the binding of AAA-ATPase rings facilitates the repositioning of the N-terminal extensions of the alpha subunits to open the central gates. The alpha ring gate of mycobacterial proteasomes can also be widened by Bpa, a just recently identified non-ATPase ring, suggesting that the AAA-ATPase activity is not required for alpha ring gating (Bolten et al., 2016). Unlike the AAA-ATPase heterohexamer of the eukaryotic proteasome, the bacterial AAA-ATPase ring is a homohexamer (Striebel et al., 2009). Structurally, the prokaryotic AAA-ATPases resemble the eukaryotic counterparts. They all contain an alpha-helical domain close to the variable N-terminus followed by the oligonucleotide- and oligosaccharide binding domain (OB) and an AAA-ATPase domain, consisting of a RecA like subdomain and the α helical, C-terminal subdomain (Wendler et al., 2012). ATP binds to the Walker A motif between the two subdomains. Conserved loop residues line up the central pore of the AAA-ATPase ring which grip the unfolded protein substrate for translocation (Figure 3). Figure 3. Active site organization of AAA-ATPase rings. (A) Bottom view of the proteasomal AAA-ATPase rings from yeast (upper panel) and human (lower panel). The Walker domain A is highlighted by red spheres and B by blue spheres. Magnified views of the Walker domains are shown for human AAA-ATPase bound to either ATP (B) or ADP (C) in two orientations. (D) Dynamics of Valosin-containing protein-like ATPase of Thermoplasma acidophilum (VAT) are visualized by conformational switches between the stacked and spiral (split-) ring versions. Side and top views of the AAA-ATPase subunit colored in red show movements out of the plane upon ATP hydrolysis aiding substrate translocation into the proteasome through its central pore. The split ring form (bottom left) undergoes a conformational change back into the stacked ring (top left), when ADP dissociates from the subunit and ATP binds back to allow the next round of hydrolysis. This figure was prepared using the PDB IDs: 4CR2, 5L4G, 5G4G, and 5G4F through PyMOL (Ver. 1.8.0.2) molecular graphics software (Schrodinger, LLC, New York). In PAN, which is an archaeal proteasomal AAA-ATPase ring, the six OB subdomains form the N-ring, while the N-terminal sequences adopt alpha-helical conformations and pair into three coiled coils. A conserved proline residue at the base of the N-terminal helix adopts a cis-conformation introducing a kink of the helix that allows coiled-coil formation with its neighbor subunit. 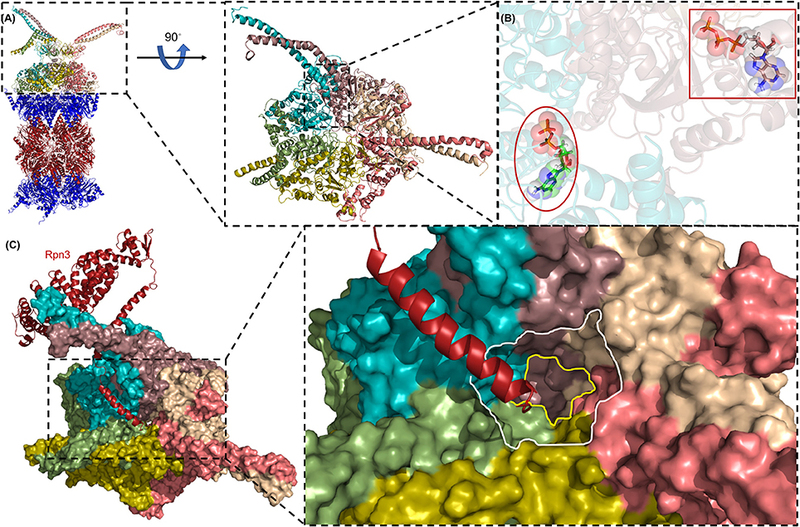 To unfold and inject a protein the internal pore loops in the RecA like subdomain move the target protein toward its C-terminal end (Yu et al., 2010). PAN only transiently associates with 20S proteasomes from archaea (Barthelme and Sauer, 2012), unless a genetically engineered cystine bridge stabilizes the docking of the C-terminal HbYX motif in the alpha ring binding pocket of the 20S proteasome (Barthelme et al., 2014). In general, Clp AAA-ATPases follow an ATP hydrolysis pattern different from eukaryotic AAA-ATPases. The ATP hydrolysis pattern is best studied in the homohexameric ClpX AAA-ATPase while velocity and processivity of most proteasomal AAA-ATPases still remain elusive (Lupas and Martin, 2002). The bacterial AAA-ATPase ClpX hydrolyzes ATP in a semi-stochastic way with a hydrolysis rate of ~100–500 ATP molecules per minute in the absence of substrate. In association with a protease substrates are degraded with high velocity but low processivity slipping back and forth, once the AAA-ATPase encounters a folded domain (Aubin-Tam et al., 2011; Maillard et al., 2011; Nager et al., 2011; Baytshtok et al., 2015; Iosefson et al., 2015; Rodriguez-Aliaga et al., 2016). In contrast to the prokaryotic systems, the AAA-ATPase of the eukaryotic proteasome is a heterohexamer suggesting specialization among the six different ATPase subunits (Rubin et al., 1998). The six ATPase subunits arrange in a particular order: Rpt1-Rpt2-Rpt6-Rpt3-Rpt4-Rpt5 (Tomko and Hochstrasser, 2011) (Figure 3). The N-terminal domains form coiled-coils, as Rpt2, Rpt3, and Rpt5 contain a conserved proline residue at the base of the helix that build coiled-coils with significant differences in their length and breaks of the symmetry. The binding of the proteasomal AAA-ATPase ring to the alpha ring of the proteasome requires the highly conserved penultimate tyrosine residue within the C-terminal HbYX (hydrophobic-tyrosine-any amino acid) motif (Smith et al., 2007; Rabl et al., 2008). Upon ATP binding the subunits with HbYX motifs bind to inter-pockets between two alpha subunits of the CP like a “key in a lock” (Figure 4). With bacterial AAA-ATPases consisting of homohexamers six identical HbYX motifs can interact with seven alpha subunit pockets, stabilizing the interactions of the ATPase AAA protease complex (Jastrab and Darwin, 2015). Figure 4. The AAA+ ATPase ring of the yeast 26S proteasome. (A) Structure of an assembled yeast proteasome showing half of the catalytic core particle (CP) attached to the regulatory particle (RP). The AAA-ATPase ring is highlighted in colors. (B) A magnified view of the AAA-ATPase ring containing the subunits Rpt1 to Rpt6. The N-terminal coiled-coils are formed by Rpt1 and 2, Rpt4 and 5, and Rpt3 and 6. 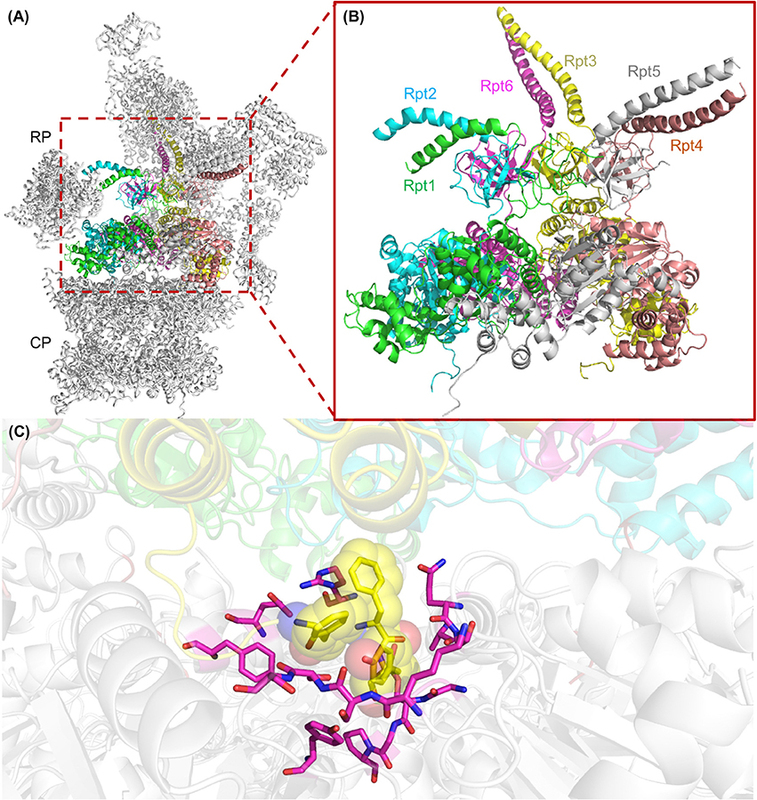 (C) The interface between the ATPase ring and the CP is shown with the HbYX motif at the C-terminus of Rpt3 (highlighted as yellow spheres) digging into the alpha subunit binding pocket of the CP. Residues of CP alpha subunits that line the binding pocket of the HbYX motif are highlighted in magenta. This figure was prepared using the PDB ID: 4CR2 through PyMOL (Ver. 1.8.0.2) molecular graphics software (Schrodinger, LLC, New York). Though four out of six proteasomal AAA-ATPases, namely Rpt1, 2, 3, and 5, have HbYX motifs, gate opening could be induced by C-terminal peptides of Rpt2 and Rpt5 suggesting that the hexameric ATPase ring is mainly anchored by two contact sites to the heptameric ring of the alpha subunits (Smith et al., 2007). In the proteasome purified from yeast, the C-terminal HbYX motifs of Rpt2, Rpt3, and Rpt5 turned out to bind to the inter-pockets between alpha 3–4, 1–2, and 5–6, respectively. A rotation in the alpha subunits and displacement of a reverse-turn loop occluding the central pore are induced, so that the open gate conformation is stabilized within the holo-enzyme and substrate entry is facilitated (Rabl et al., 2008; Park et al., 2013) (Figure 5). Figure 5. The AAA-ATPase ring of the human proteasome. (A) The AAA-ATPase is located on the alpha ring of the CP. The catalytic beta-subunits are colored in red, the alpha-subunits in blue. A magnified view of the AAA-ATPase ring is shown on the right. Coiled-coils of N-terminal regions reach out to other RP subunits. (B) The AAA-ATPase subunit colored in cyan is bound to ADP (red ellipse), while the other five AAA-ATPase subunits are bound to ATP (red box). (C) Rpn3 acts as sensor to induce conformational changes in the RP upon substrate docking into the ATPase ring (shown as a surface diagram). The C-terminus of Rpn3 colored in red is close to the pore of the N-ring (white line) and the O-ring (yellow line). This figure was prepared using the PDB ID: 5L4G through PyMOL (Ver. 1.8.0.2) molecular graphics software (Schrodinger, LLC, New York). The loops of the ATPase subunit lining the central pore of the hexamer are suspected to contact the substrate to be unfolded. ATP hydrolysis triggers conformational changes of individual ATPase subunits that exert a pulling force to unfold and translocate the substrate through the narrow central pore of the CP alpha ring which is consecutively widened enough to accommodate an unfolded polypeptide chain. The hydrolysis rate of proteasomal AAA-ATPases is ~30–50 molecules of ATP per minute which is considerably slower than the rate of ClpX AAA-ATPases (Hoffman and Rechsteiner, 1996; Kraut et al., 2012; Kim et al., 2015). The slow velocity allows more processivity during substrate degradation, that the machinery does not stall but rather drives through without slipping, when it approaches a folded domain (Smith et al., 2011; Kim et al., 2015). In eukaryotic proteasomes the substrate polypeptide is engaged with the unfolding activity of the AAA-ATPase ring concurrently with the removal of the tetra-ubiquitin chain but the recognition of the poly-ubiquitin chain is not sufficient for degradation. The proteolytic engagement requires an unstructured initiation site which reaches through the OB-domain containing N-ring to the AAA-pore (Prakash et al., 2004). The site of the poly-ubiquitin chain to be cleaved off must be approximately thirty amino acids away where the ubiquitin isopeptidase activity of Rpn11 is located. The length of approximately thirty amino acids is also required for proteasomal model substrates with accessible termini, that are degraded in vitro by proteasomes independently of ubiquitination (Kraut et al., 2007; Takeuchi et al., 2007). In some instances, one or two ubiquitin molecules are already sufficient for signaling degradation suggesting that the tetra-ubiquitin chain is not necessarily a switch-on for degradation. The question is what could be the molecular ruler beside the poly-ubiquitin chain on which a protein is recognized as proteasomal substrate. The susceptibility of the unstructured regions of the substrate to unfolding determines the efficacy of degradation rather than the anchoring of ubiquitin to the proteasome (Prakash et al., 2004). Also the size of the protein seems to determine the pathway of degradation in favor of mono- over poly-ubiquitylation (Shabek et al., 2012). The accessibility of lengthy poly-ubiquitin chains to VAT/Cdc48, an abundant ubiquitous AAA-ATPase transiently interacting with archaeal proteasomes, also influences the fate of a proteasomal substrate, as Cdc48 facilitates the extraction of protein substrates stuck into membranes and protein aggregates (Godderz et al., 2015). According to current models of AAA-ATPases individual subunits are in different stages of the ATPase cycle. Prokaryotic AAA-ATPases such as ClpX hydrolyze ATP in a semi-stoichastic manner, whereas eukaryotic AAA-ATPases of the proteasome are suggested to hydrolyze ATP in an ordered and sequential cycle by binding ATP molecules to the ortho position (direct neighboring subunit) of the hydrolyzed ATP molecule. Allostery between eukaryotic AAA-ATPase subunits is mediated by trans-arginine-fingers which are lacking in ClpX reflecting structural differences with regard to ATP hydrolysis and potentially resulting in distinct strategies for protein unfolding (Kim et al., 2015). ATP binding and hydrolysis induce coordinated conformational changes (Smith et al., 2011; Stinson et al., 2013). With saturating ATP concentration, all six Rpts adopt a staircase arrangement, with Rpt3 at the highest step and Rpt2 at the lowest step relative to the CP, whereas the C-terminal domains are positioned in a plane above the CP (Lander et al., 2012). Engaged with a substrate the staircase arrangement is no more present (Matyskiela and Martin, 2013). Subunit staggering and staircase arrangements are not due to the asymmetry of the heterohexameric ATPase ring of RP. It has been observed for prokaryotic homohexameric ATPases as well (Thomsen and Berger, 2009). Could the stair case configuration be static and represent the optimal acceptor state for incoming polypeptides that have to be accommodated from different sites above the central entry pore? Ubiquitin-hydrolyzing activities by Ubp6 and Rpn11 and their corresponding ubiquitin receptor sites are asymmetrically positioned in the RP and hover above the substrate entry port of the Rpt ATPase ring. Substrate or ATP binding may swing the active site of Rpn11 toward the central pore of the AAA-ATPase from a discontinuous conformation to a position in which the AAA-ATPase pore is properly aligned with the alpha ring gate of the CP (Matyskiela and Martin, 2013). The archaeal VAT ATPase, the archaeal counterpart of Cdc48/p97, showed a staircase arrangement of the homohexameric ring, when at least one subunit was bound to ADP (Huang et al., 2016). Mutations in critical tyrosines of the VAT-pore loops cause defects in protein unfolding and translocation (Gerega et al., 2005). Snapshots obtained by cryo EM and NMR studies revealed that the movement between stacked and split-ring structures for VAT suggests repeated cycles of ATP binding and hydrolysis by setting the central pore on different heights to generate the pulling force on the substrate. They reflect substrate-AAA pore loop contacts with the translocation channel into the proteasome (Figure 3D). Transient intermediates of substrate translocation through VAT ATPase were captured by cryo EM. Substrate binding breaks the six-fold symmetry, allowing five of the six VAT subunits to constrict into a tight helix that grips an ~80 Å stretch of unfolded protein. The structure suggests a processive hand-over-hand unfolding mechanism, where each VAT subunit releases the substrate in turn before re-engaging further along the target protein, thereby unfolding it (Ripstein et al., 2017). All mechanistic studies on AAA-ATPase before occurred on idle hexamers with no unfolded peptide in the process of translocation (Ripstein et al., 2017). How many of the six subunits of the hexamer are actually loaded with nucleotides, is not definitively determined, unless we assume that the subunits were oversaturated with either non-hydrolyzable analogs of ATP and completely bound to ADP. Negative allostery might be possible when ATP binding to one site prevents nucleotide binding to another site. Furthermore, it is unclear whether the six subunits of the ATPase have hydrolyzed ATP in a random, sequential or concerted manner. Electron cryo-tomography in cells also revealed asymmetrically twisted Rpt ATPase rings in 26S proteasomes which were assigned to enzymes engaged in degradation compared with idle enzymes in the ground state after ATP hydrolysis. The AAA pore loops are aligned in a spiral plane in the ground state and in a nearly planar configuration in the engaged state (Matyskiela and Martin, 2013; Unverdorben et al., 2014). When active site mutants in Rpt subunits were compared, the most severe effects on protein degradation were observed for mutations in Rpt subunits within pore loops closest to the substrate entry point in the OB-containing N-ring pointing to the hot spot, the “commitment step” for final degradation (Erales et al., 2012; Beckwith et al., 2013). Recent advances in dual-laser optical trapping technologies on single molecules allowed testing the existing models of protein unfolding and degradation. Sophisticated reporter substrates such as ssrA-degron-(unfolded Titin)4 were engineered to measure the mechanical forces that apply on these substrates during translocation (Maillard et al., 2011; Sen et al., 2013; Cordova et al., 2014). Bacterial ClpP protease bound to either double ring AAA-ATPase ClpA or single ring ATPase ClpX were compared for the translocation capacity of the reporter substrate. It was substantially faster degraded but slower translocated by the protease with the ClpA double ring compared with the ClpX single ring (Olivares et al., 2016). The fundamental translocation step is independent of double or single ring architecture supporting the conclusion that constrains imposed by the nucleotide state determine the size of a single power stroke (Glynn et al., 2009; Stinson et al., 2013). Similar settings in a dual optical tweezer assay using a GFP-labeled variant of ssrA-degron-(unfolded Titin)4 allowed further characterization of the mechanochemical cycle of ClpXP. The AAA-ATPase motor is cycling through two phases. In the dwell phase ClpXP does not move its substrate. In the burst phase CplXP pushes the substrate in increments of few nanometers, resulting in a near simultaneous ATP-driven conformational change of single ATPase subunits, thereby propelling the substrate via individual power strokes (Aubin-Tam et al., 2011). ADP release and ATP binding occurred in the dwell phase, whereas ATP hydrolysis and phosphate release happened in the burst phase. Conformational re-settings of the pore loops appear to determine the time for ADP release from individual ATPase subunits (Rodriguez-Aliaga et al., 2016). Recent single particle cryo-EM analysis of human 26S proteasomes to near-atomic resolution provided complementary information about the substrate-unfolding AAA-ATPase channel in its nucleotide-bound state (Chen et al., 2016) (Figure 5). The AAA pore is shaped by inward facing pore loops, which are arranged in two parallel helixes, one is populated with hydrophobic and the other with charged amino acid residues. The interior of the AAA channel is negatively charged, the interior of the OB channel positively charged. Both parts of the channel are enriched by crucial tyrosine residues, which feature the conserved hydrophobic Tyr/Phe-Val/Leu/Ile-Gly pattern. The resolution of this critical region of the AAA-ATPase allowed the differentiation of four proteasome configurations. Six ATP molecules were tentatively modeled into the binding pockets, because the nucleotide state could not be determined for each Rpt subunit due to the averaging of single particle images. Surprisingly, the alpha rings of the CP were closed in three out of four conformations. The Rpt subunits seem to be in direct contact with the alpha ring of the CP by anchoring the HbYX motif of Rpt5 but not of Rpt2 into the respective inter-pocket of the CP alpha ring. Movements of the Rpt subunits on the alpha ring eventually facilitate the reach out of the HbYX motifs to Rpt1, 2, and 6 to their nearest inter-pockets, until remaining gate-blocking C-terminal tails align along the center axis of the pore. Taken together, the opening is primed through a series of coordinated, stepwise remodeling events including the RP lid swinging in the appropriate position above the axial channel (Chen et al., 2016). The configuration of the ground state with the closed CP gate was consistent with recent high-resolution cryo-EM structures (Huang et al., 2016; Schweitzer et al., 2016). Rpt6 is structurally distinct from the other five Rpt subunits, most notably in its pore loop region. Moreover, the C terminus of Rpn3 was found to protrude into the ATPase ring and proposed to trigger conformational changes to the AAA-ATPase ring (Figure 5). Rpn1 and Rpn2, the largest proteasome subunits, are linked by an extended alpha helix suggesting coordinated co-operations between the RP ATPases and non-ATPases to orchestrate substrate recognition, unfolding and translocation (Schweitzer et al., 2016). The proteasome is committed to operate processively on a substrate and determines the substrate's fate (Lee et al., 2001). However, successful initiation of substrate translocation, presumably by the synergistic interaction between the AAA pore loops and the translocation channel into the CP, does not guarantee the execution of proteolysis, when pore loop interactions with the gripped substrates are lost, especially when slippery elements of low complexity or intrinsically disordered sequences are positioned adjacent to folded domains. Especially, repetitive sequences of glycine-alanine residues resulted in the blockage of degradation, because the AAA-ATPase seems to slip on the repetitive sequences without being able to grasp the polypeptide (Levitskaya et al., 1995; Zhang and Coffino, 2004). The preferences of the AAA-ATPases for specific sequences seem to provide an additional component to the degradation code and may fine-tune the half-lives of cellular proteins. Clusters of glutamate repeats inhibited degradation of the protein (Fishbain et al., 2015), possibly by being repulsed by negatively charged amino acid residues in the AAA-pore (Chen et al., 2016). Ubiquitin-associated domains (UBA) protect against proteasomal degradation which is detrimental for shuttling ubiquitin receptors such as Rad23 and Dsk2 which deliver poly-ubiquitylated substrates to the proteasome without being sacrificed. Insertion of an UBA domain near an intrinsically disordered region stabilizes the protein (Heessen et al., 2005; Heinen et al., 2011). Tetra-ubiquitin can also be covalently linked to a subunit of a protein complex to be targeted to the proteasomes without being degraded, because the subunit is sufficiently folded and not extracted by the Rpt ATPases. Instead, the neighboring subunit having an intrinsically disordered domain is degraded (Prakash et al., 2004). Also the other way around is known that a ubiquitinated subunit of a complex is degraded, while the neighboring subunit remains intact (Hochstrasser and Varshavsky, 1990; Johnson et al., 1990; Verma et al., 2001). Thus, the Rpt AAA-ATPases seem to favor the substrate with the easiest accessible termini and the most likely initiation site, an unstructured region penetrating to the ATPase pore loops. Unstructured regions such as the 37 amino acid long C-terminal tail of ODC, bind so tightly to the AAA-ATPase that poly-ubiquitination is not required for degradation as known for other degrons in the bacterial and archaeal system (Erales and Coffino, 2014). In vitro, proteins with largely unstructured regions such as NQO1 are even being degraded by the CP without the aid of Rpt AAA-ATPases, but this mechanism is yet to be verified in vivo (Moscovitz et al., 2012). The RP base complex harboring the Rpt AAA-ATPases was also shown to exhibit foldase activity of AAA-ATPase chaperones. Denatured citrate synthase without ubiquitin modification was refolded and reactivated by Rpt ATPase without being degraded by proteasomes (Braun et al., 1999). Finally, proteasomal AAA-ATPases have also been propsed to be involved in non-proteolytic re-folding processes such as nucleotide excision repair (Gillette et al., 2001; Gonzalez et al., 2002). DNA microarrays revealed RP subunits but no CP subunits to be associated with chromosomal DNA. However, the experimental conditions under which chromatin immunoprecipitation assays are performed may weaken the interaction between RP and CP resulting in the dissociation of the CP from the RP. Different—and sometimes incompatible—models based on NMR, X-ray, and cryo-EM structure analysis are available to visualize important steps in protein substrate unfolding and translocation through AAA-ATPases which are associated with proteasomes and proteasome-like proteases. The usage of optical tweezers and fluorescence microscopy on single molecules allowed the first comprehensive mechanochemical characterization of a bacterial AAA-ATPase. Its motor power reconciles the product of generated force and translocation velocity. This novel approach is expected to add detailed pictures of how the chemical transitions in the ATPase cycle of an AAA-ATPase are coupled to the dwell and burst phases of the motor between its grip on the substrate and its pulling frequency. Future studies based on this technology will reveal whether related AAA-ATPases, including the eukaryotic 26S proteasome, may use similar mechanisms for ATP-dependent substrate unfolding and translocation. CE is the corresponding author, wrote the first draft of the manuscript and approved the final version for publication. RY prepared the Figures and Figure legends. PW has substantial, direct and intellectual contribution to the work, and approved it for publication. This work was supported by grants from NSERC (4422666), CIHR (325477) to CE, and the Deutsche Forschungsgemeinschaft to PW (WE4628/1). Copyright © 2017 Yedidi, Wendler and Enenkel. This is an open-access article distributed under the terms of the Creative Commons Attribution License (CC BY). The use, distribution or reproduction in other forums is permitted, provided the original author(s) or licensor are credited and that the original publication in this journal is cited, in accordance with accepted academic practice. No use, distribution or reproduction is permitted which does not comply with these terms.